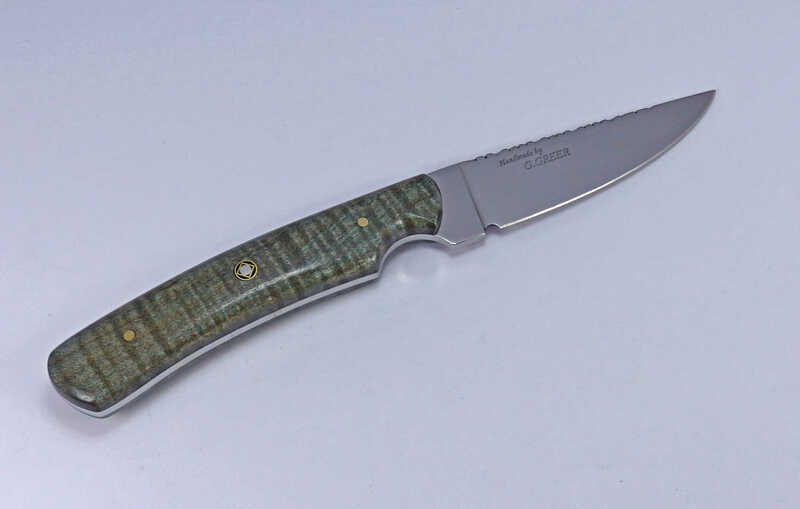 High quality blue-green flame maple sportsman knife. The full tang fixed blade construction and stabilized maple wood handle make this knife solid, dependable and easy to clean. A comfortable grip in most hand sizes, this ergonomically designed handle is a great fit for anyone. Wondering about the unique color in the handle? It comes from double dying during the stabilizing process which gives this flame maple its beautiful blue-green color. A custom handmade, welted and fitted leather sheath is included with this fixed blade sportsman knife. For other unique blades, see W11 or W16. Blade length is 3.75 inches with overall length of 8.5 inches. Full tang construction, ATS-34 stainless steel hardened and tempered to RC 59-60. This hardening process is necessary if you want a seriously sharp blade and good edge retention. Filework on the spine helps support a firm grip for those that like to choke up on the blade. This drop point knife can be used for any outdoor task where a smaller, sharp blade is needed.